Chairman of the Israeli Labor Party, Avi Gabbay walking through the Carmel Market, Tel Aviv, 3 April. Image from Twitter. 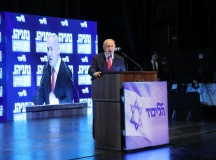 Tal Harris argues that while Benny Gantz can replace Netanyahu and remove his Kahanist allies from the public sphere, only a strong Labor presence in Gantz’s coalition can ensure the replacement of Netanyahu’s policies by social justice and peace. There are two choices in these elections: siding with the supporters of Kahane or siding with their opposition. This unheard-of situation became reality because of Netanyahu’s recent actions. 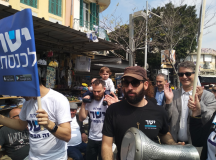 A small yet sophisticated and dangerous group of Kahane supporters running under the name “Jewish Power” are now, thanks to Netanyahu’s efforts to forge a right wing merger – due to be MKs. This is one of many reasons why I hope that Netanyahu will leave the Premiership following April’s elections. Meir Kahane was an MK (1984-1988) who called for a segregated Israeli society: segregated beaches for Jews and non-Jews, forbidding non-Jews to reside in Jerusalem, stripping Israeli citizenship from non-Jews, and sentencing mixed couples to decades in jail. To this day, a member of “Jewish Power” proudly keeps a picture of Baruch Goldstein – the Jewish terrorist who killed dozens of Palestinian civilians in Hebron in February 1994 – in his office. Thanks to Netanyahu, this man could soon be elected and Goldstein’s picture could hang in the Knesset. The good news is that we have a large liberal majority in Israel who are against these policies. It has been a far too silent, lenient, and passive majority so far, but I hope that it will give the necessary mandate to form a government to the new centrist party, led by Benny Gantz and other former IDF Chiefs of Staff. They will certainly reject Netanyahu’s Kahanist allies and would possibly ban them from running in the future, as Kahane was himself after his single term in parliament. Yet, in the coming elections I will vote Labor. My choice is not an obvious one. After all, Gantz has the best chance of forming a coalition that can replace Netanyahu, and I have several reservations concerning Avi Gabbay, the Party chairman, notably his lack of experience, policy zigzags and all-to-frequent attempts at pandering to the right wing. There is nothing exceptional about my reservations – after all, if there is one thing that unites leftists around the world, it is this capacity to become divided and outraged over different clauses in their party program. Yet despite these reservations, I will vote Labor: While Gabbay is unlikely to remain chairman for long, Labor remains the most likely and most ideologically reliable coalition partner for a future Gantz-led government. Global challenges such as climate change, migration, the exponentially growing concentration of wealth among a small number of individuals, and automation of the job market all require global cooperation. 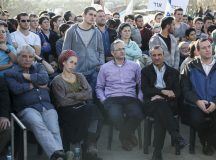 My future in Israel – the ability to offer free, enlightened education to my future children, to afford adequate health services for myself when I get older, and the trust that my privatized pension fund savings will not evaporate during the next financial crisis – all require a strong Labor Party. Facing global challenges, Labor will support more global cooperation. Facing neoliberal assaults that deprive workers, young families, and pensioners of their dignity and their social safety nets, Labor will provide protection. Most importantly, Labor is the only party that will push the eclectic Gantz-Yaalon-Lapid-Ashkenazi alliance to end control over millions of Palestinians, stop illegal land grabs, and revive the peace process. 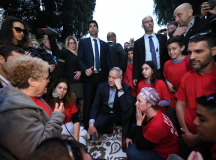 Gantz can replace Netanyahu and remove his Kahanist allies from the public sphere, but only a strong Labor presence in Gantz’s coalition can ensure the replacement of Netanyahu’s policies by social justice and peace. That is why, on April 9, I will vote Labor.